Trade War! The very words inspire dark connotations. They sound like a battle cry, one short step from the peasantry charging across verdant fields, wielding pitchforks and hot oil against the Saxons. What is a trade war, anyway. Did we just start one? If so, why? What does a trade war mean for the world economy? Moreover, what does it mean for your personal economic situation? Today, Gildshire dons our Economist hat and attempts to put the news into readable perspective. These were your questions. Our answers should clear up some of the clouds. What is a trade war and what causes the beginning of one? Okay, two questions in one. So, let us dive right in. A trade war is when the free market is, at least temporarily, abandoned. 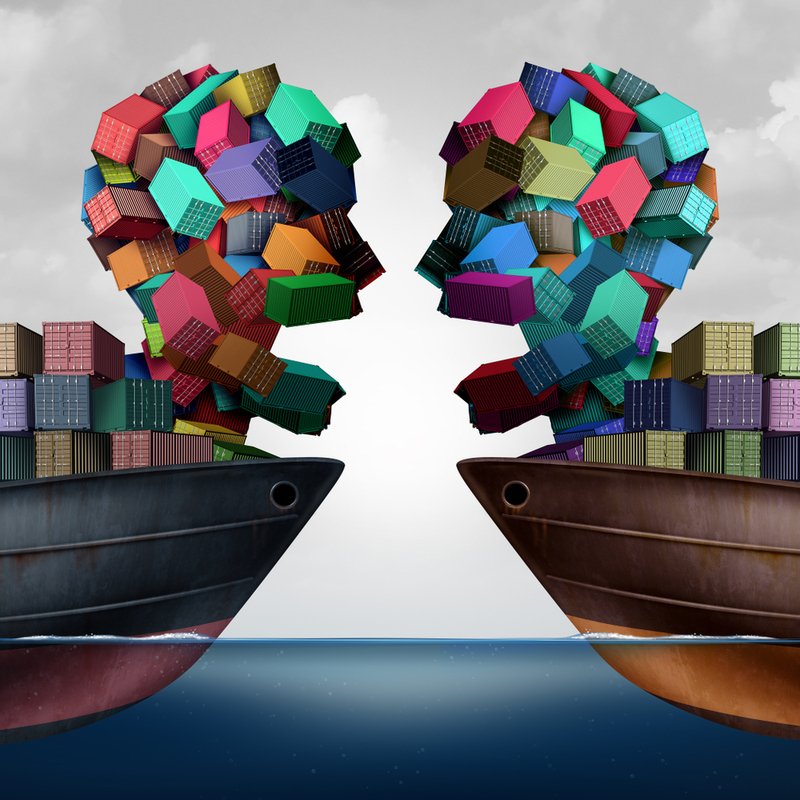 One entity (in this case, the United States) puts a tariff (or extra charge) on goods coming in from one or more other entities. That starts the war. What does the other side do in response? Just like in any war, the first shot draws return fire. In a trade war, the other entity puts an extra charge on what it imports from the first party. “Trade War” sounds scary, but is it? Did we just start a trade war? It looks that way. President Trump said that his administration will impose a tariff of 25% on steel imports and one of 10% on aluminum imports. In case you were wondering if this is a big deal, know that the U.S. is the world’s biggest steel importer. Is this the economic equivalent of a world war? It might be, however, some of our closest friends (think Canada and, perhaps, the E.U.) could be exempted. Why steel and aluminum? Don’t we need cheap materials to make cars, ships, that kind of thing? We do, but the goal is to prop up American steel and aluminum and stop companies from buying less-expensive materials from foreign countries. It was part of the President’s campaign pledges that played well in the Rust Belt. I know this will make us unpopular around the world, but it sounds like a winner for American business. Yes, yes, and no. Let me break my answer into pieces. Yes, it will make us unpopular around the world. Whether that is a big deal, small deal, or no deal to you, depends on your position on the U.S. as a member of the World Community. Yes and no to its effect on American business and enterprise. U.S. Steel and Alcoa will benefit, perhaps greatly, but some sectors of American manufacturing will be hurt by rising steel and aluminum prices. Which U.S. companies will take a hit from the tariffs? Everything that uses a lot of steel or aluminum. Cars to softball bats to beer cans. The price of any of these could increase as a result of purchasing higher-cost U.S. products. Like Canada: Yes, like Canada, can manufacture steel and aluminum less expensively. Okay, if (and when) another country retaliates, what will they choose to retaliate against? In other words, what is our vulnerability? We’re vulnerable on many fronts, as we have a diverse economy. That said, experts predict the other sides of the trade war to take aim at soybeans and Boeing. It is fairly easy to find soybeans in places other than the United States. You can buy a plane from Airbus, rather than Boeing, with a vote from the Board of Directors and a phone call to Toulouse, France. The stock market must have an opinion on this whole trade war thing. Oh, it does and a strong one at that. The Dow Jones Industrials are in the process of giving back all of its gains from early this year. On Jan. 26, that key index closed at 26,616.71. Today, it rests at 23,644.19. All because of the trade war? Mostly, though President Trump’s curious recent attacks against Amazon haven’t helped the market’s mood, either. So, what’s next? Well, we fasten our seatbelts and wait to see how the trade war plays out. Will it be global or targeted? Will it spread to more than just steel and aluminum, or be contained in those sectors? What will the response be from our friends? How about our enemies? However it goes, know that your friends at Gildshire will stay on top of what goes down. Well, that’s a relief! We have your back.